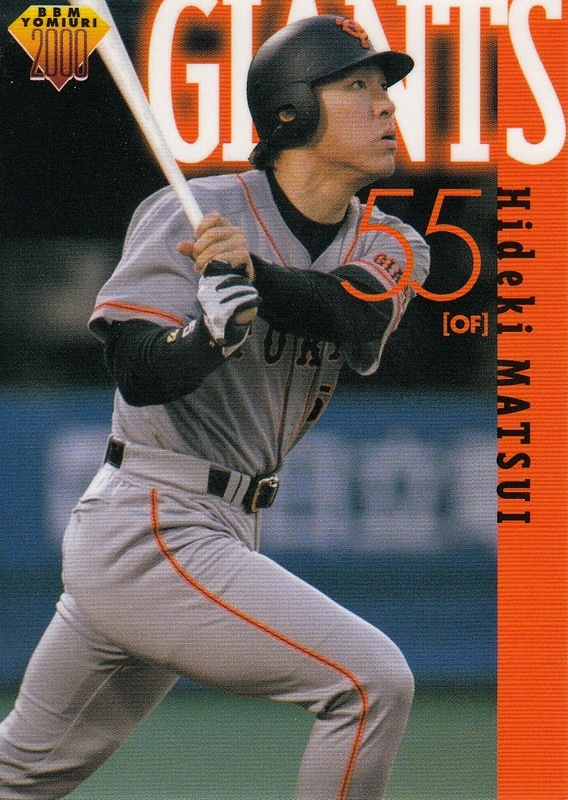 I did a post the other day about a promo card for a set that BBM did for the Giants that was distributed to subscribers of the Yomiuri Shimbun newspaper in 1999. I don't know a whole lot about that particular set but I do have a similar set that BBM did in 2000. This set was distributed to the newspaper subscribers in six four card packs that were labelled Series I, Series II, etc up to Series IV. Each pack for each Series contained the same four cards (i.e, Series I contained cards 01-04, Series II contained 05-08, etc) although there was the possibility of parallel cards. 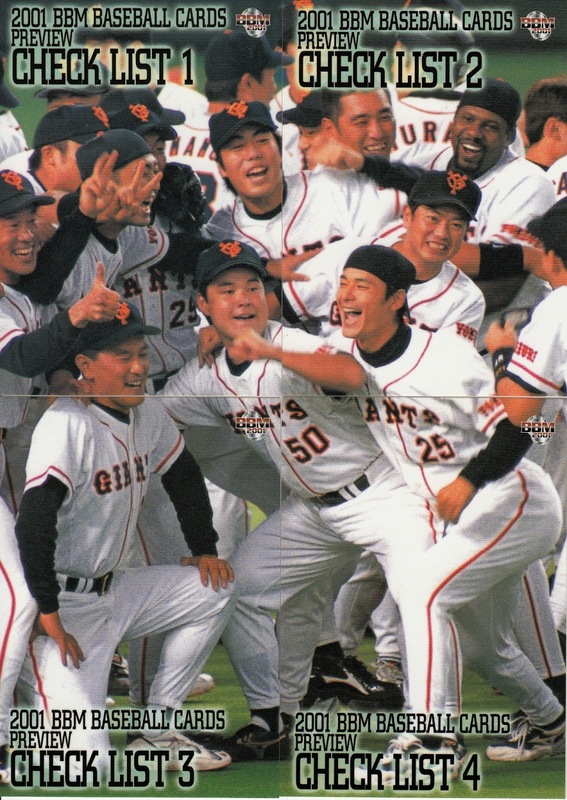 Like the 1999 set, the 2000 set was only Giants players. Series I through III and V and VI contained the "regular" cards in the set. 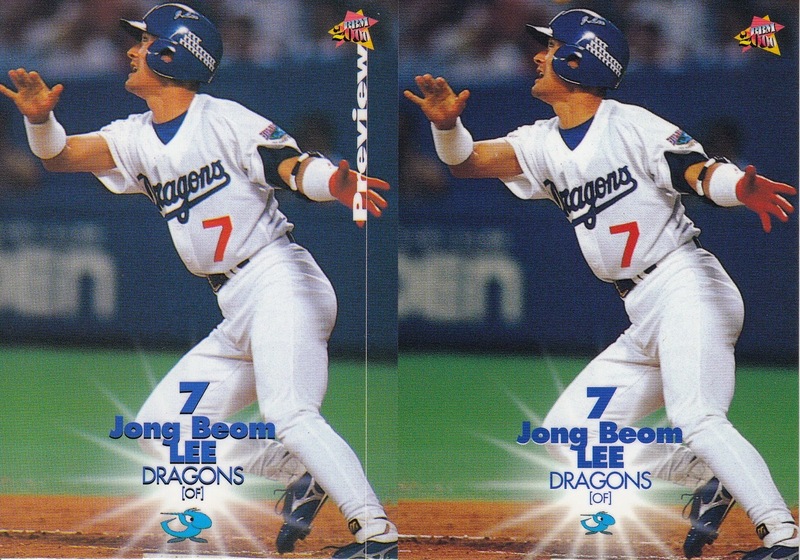 One card in each Series had two possible parallel versions - a "blue silver" version (one in every three packs) and a "gold" version (one in every 10 packs). 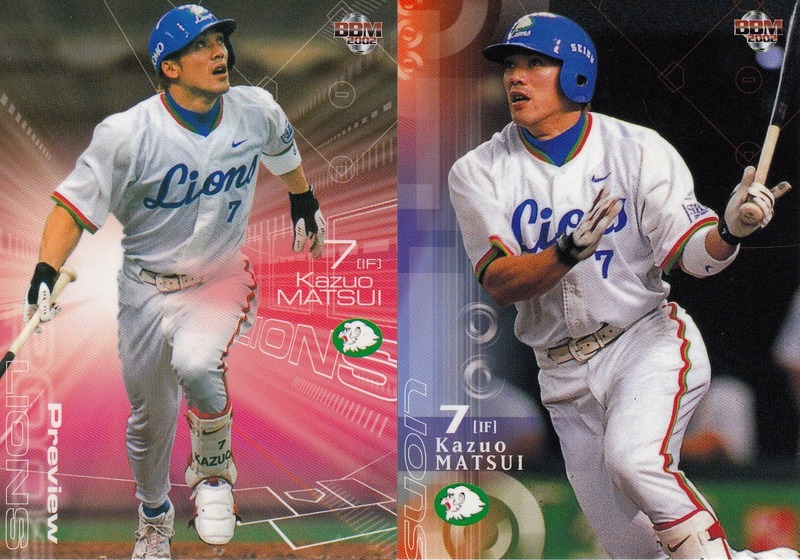 Series IV contained four cards using a different design than the rest of the set, although each of the players in the Series (Akira Etoh, Hideki Matsui, Yoshinobu Takahashi and Koji Uehara) had "regular" player cards in the rest of the set. There is a parallel "blue silver" version of each of these four cards (1 in every 100 packs). I picked this set up in unopened packs off of Yahoo! Japan Auctions a few years back but I didn't get any of the parallels though. 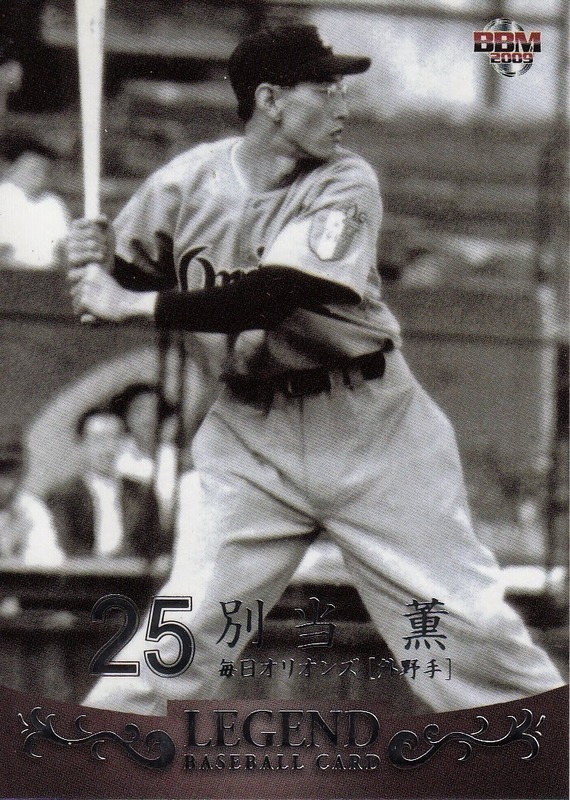 Rob Fitts' latest book "Mashi: The Unfulfilled Baseball Dreams of Masanori Murakami, the First Japanese Major Leaguer" will be published on April 1st this year (and is available for pre-order at both Amazon and Barnes & Noble). Rob is planning a lecture tour this summer with Murakami to celebrate the 50th Anniversary of Murakami's only full MLB season. He's started a Kickstarter campaign to raise money to cover Murakami's travel expenses. There are some great "thank you" gifts available for different levels of pledges starting as low as $5. Check out the campaign's webpage for all the details. I picked up a kind of odd item off of Ebay recently. 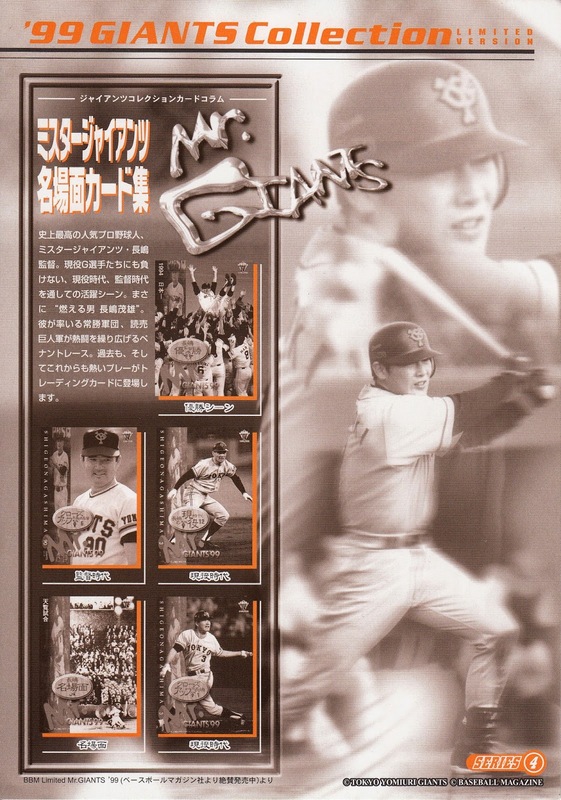 In 1999 BBM did a team set for the Yomiuri Giants that was distributed to subscribers of the Yomiuri Shimbun newspaper. The set was apparently distributed in three card packs for six different series. Each series had three "regular" cards and three "special" cards. Engel describes the "special" cards as a parallel of the regular cards but this is not the case - the "regular" cards and the "special" cards have completely different checklists and don't include the same players. The card I got off Ebay appears to be some sort of promotional item for the set. It's of Daisuke Motoki and has information about Series 4 for the set. 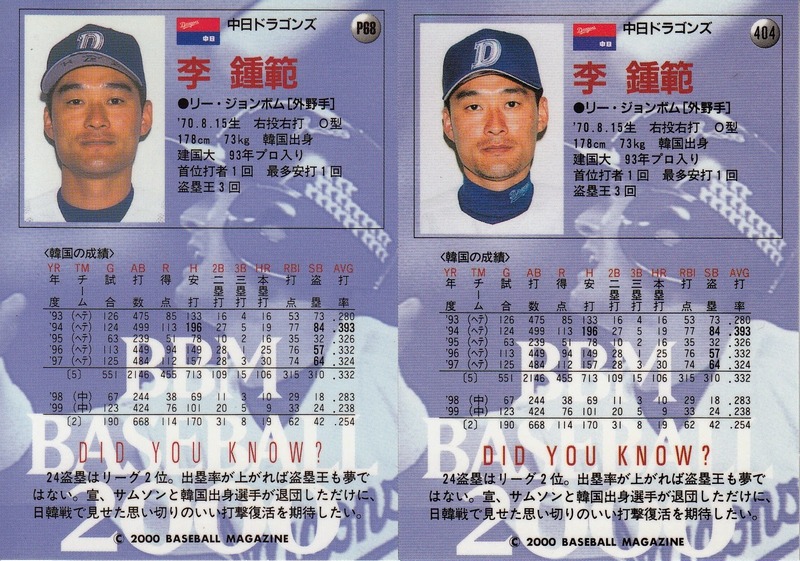 It shows the front of the three "regular" cards from Series 4 - Domingo Martinez, Toshihisa Nishi and Koji Uehara. 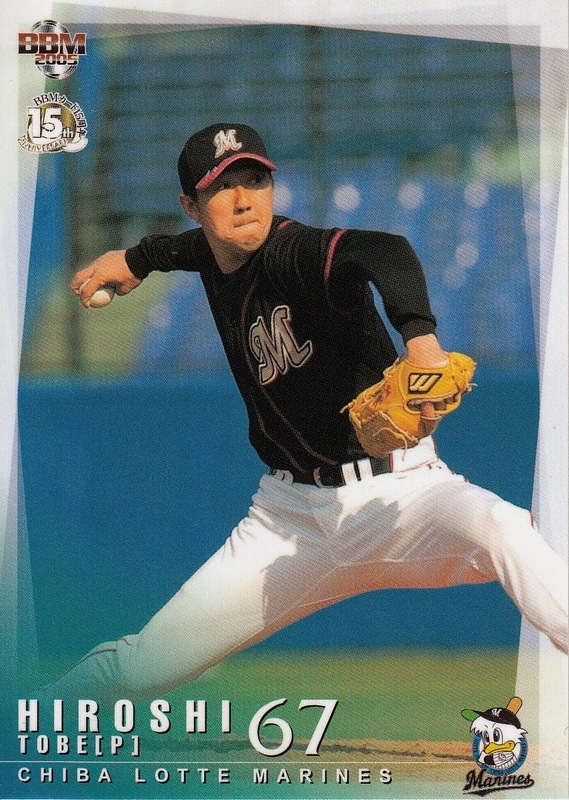 Motoki is one of the "special" cards for Series 4 (along with Yoshinobu Takahashi and Masaki Saitoh) so I actually wondered for a little bit if this was the "special" card. 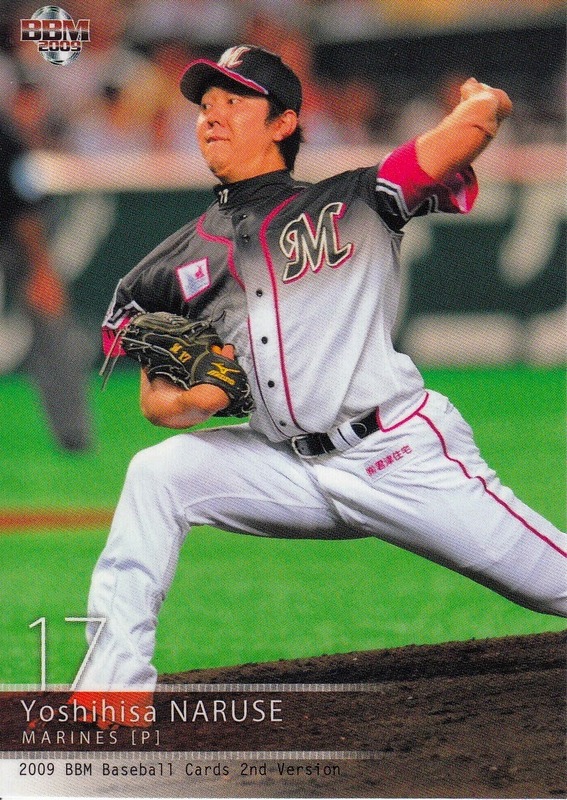 The fact that it is oversized (roughly 8 inches by 5 1/2 inches) kind of dissuaded me from that along with the fact that it has no card number (Motoki's card is #S12). Then I found the real "special" card on Yahoo! Japan Auctions. I wonder if this was some sort of advertisement for the set inserted into the newspaper. 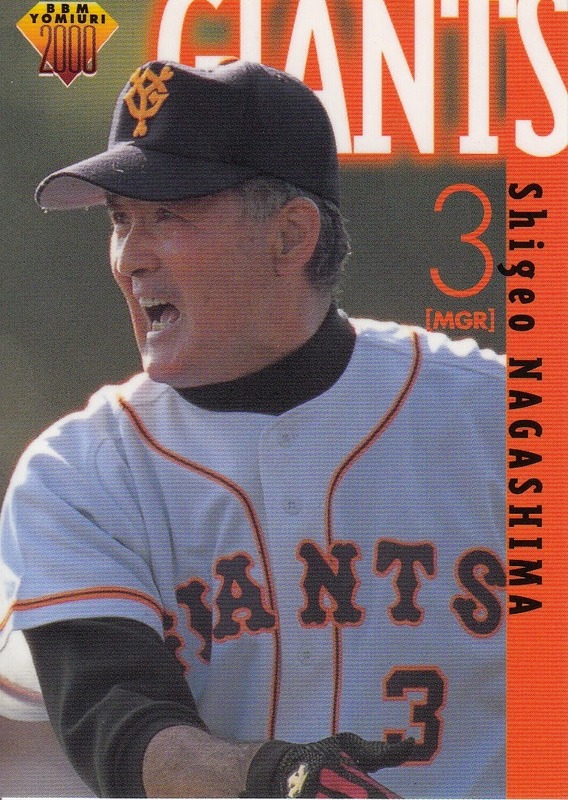 One thing I found interesting is that the back has an advertisement for another BBM set - the Shigeo Nagashima tribute set called "Mr. Giants". I've seen announcements about seven upcoming BBM sets in various places around the net but since they haven't listed them on their website yet I will instead just catch up on the non-BBM releases that have been announced. - Front Runner Trading Cards (Frontier International) is apparently renaming their "Rookies & Young Stars" team box sets this year as "Heroes & Rookies" (with a new "HR" logo on the cards). Given that it was a hard sell on some of the players being "young stars", this makes a lot more sense. (Not that there's any need for the set name to be literally true.) The first two of these sets are for the Lions and the Buffaloes. The sets are smaller than in the past - I think there are only 18 cards in each base set. Each box will contain the base set plus one of a bewildering variety of autograph cards - including ones that have two or three signatures on them. Both sets will be out in late March and have an MSRP of 9990 yen (~$84). - The Tigers are gearing up to celebrate their 80th Anniversary this year (BBM will be doing an 80th Anniversary set). 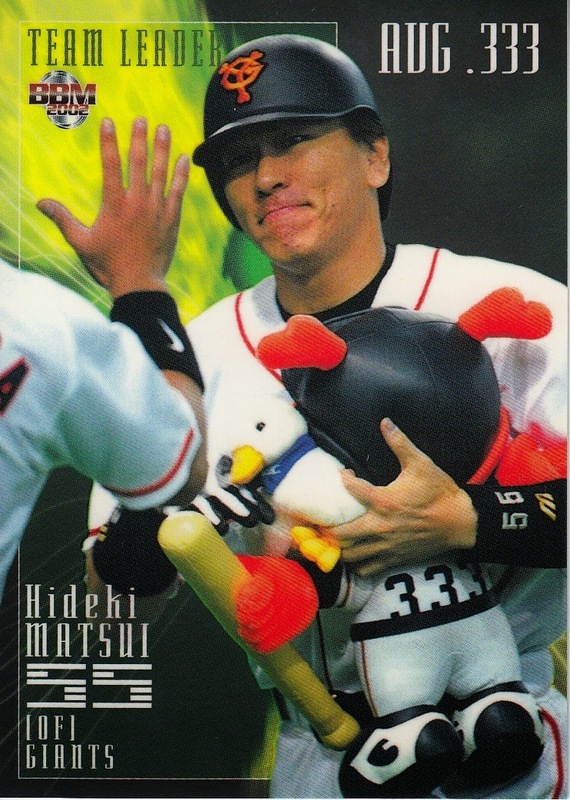 But 2015 is also the 30th Anniversary of the first (and so far only) Nippon Series championship for the Tigers and Epoch is doing a box set to celebrate the milestone. Each box will contain 52 cards - 45 cards for the base set, five parallel cards and two autograph cards. Some of the autograph cards feature two or three signatures. The set will be released in early March. - Details (and checklist) for Calbee Series One were released last week. It looks like the base set (player cards plus subset/non-premium insert sets) has actually grown a little from the 100 per Series last year to 103 this year (at least for the first Series). 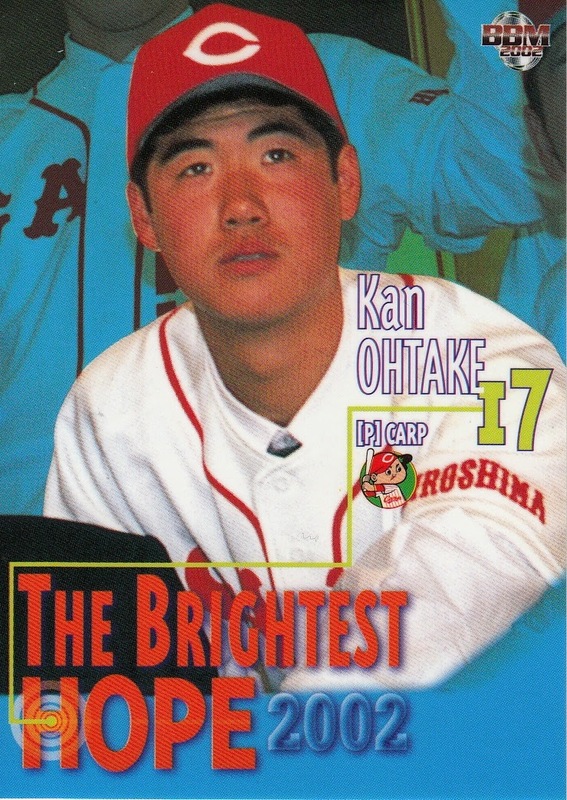 Once again there will be 84 player cards (seven per team) which will include several players returning to NPB from MLB (Daisuke Matsuzaka, Hiroyuki Nakajima and Kensuke Tanaka) and at least one player who switch teams over the winter (Yoshihisa Naruse). There will be three subsets (or non-premium insert sets): a 12 card (one for each team) "Exciting Scene" set, three "Legend Retirement Player" cards (for Atsunori Inaba, Makoto Kaneko and Tomoya Satozaki) and four checklist cards (which appear to have a theme of the 2014 post season). The ubiquitous Star (premium) insert set is back which will have (as usual) 24 cards - two for each team. 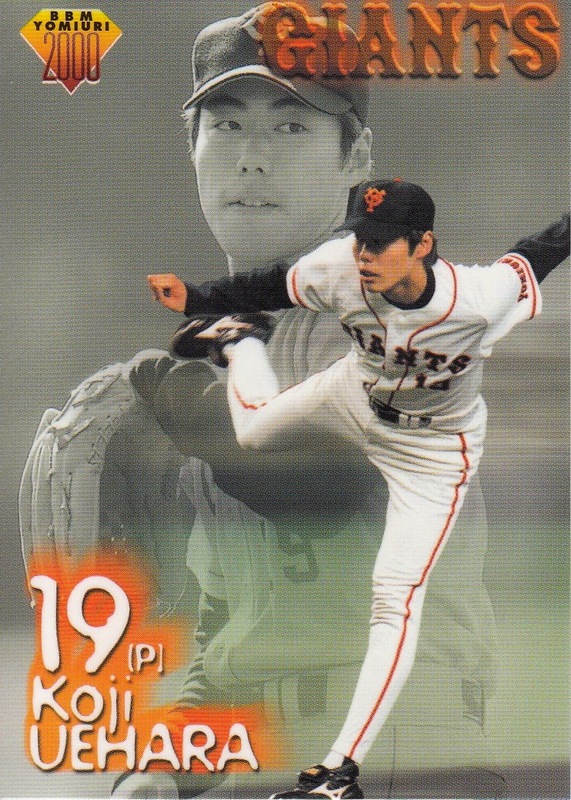 There is also a 24 card "Title Holder" set that is available as some sort of mail in premium (the 24 cards are not divided evenly between the teams) and a "lucky card" of Tomoyuki Sugano - I think it's a 3D style card. I believe that he "lucky card" is available as a redemption from a special card found in the packs. As usual, the cards will be distributed with potato chip bags and will hit the stores on March 23. I was a little disappointed in the scope of BBM's Memories Of Uniforms set a few months back. I felt that they could have given a somewhat better range of uniforms for each team. I've decided to do a series of posts for each team that shows as many uniforms as I can find that did not make the BBM set. I'm using two sources for this - my increasingly well worn copy of History Of Uniform and a mook called something like Professional Baseball Uniforms Encyclopedia 1936-2013. My plan is to do the current teams in alphabetical order then hit the defunct teams. I hope to do this relatively quickly but I fear this will drag out for a year or so like so many of my previous projects have. 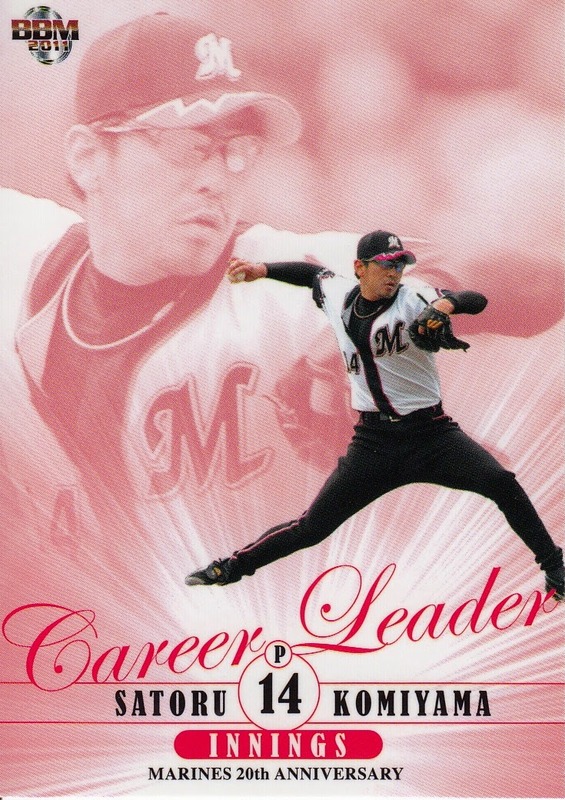 First up is the Chiba Lotte Marines. 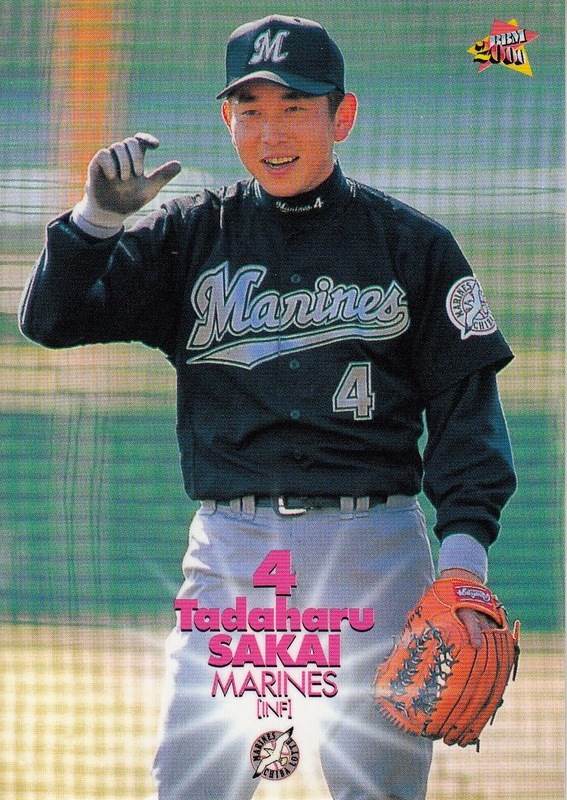 The Marines entered professional baseball in Japan in 1950 as the Mainichi Orions. They played their home games in Korakuen Stadium in Tokyo. 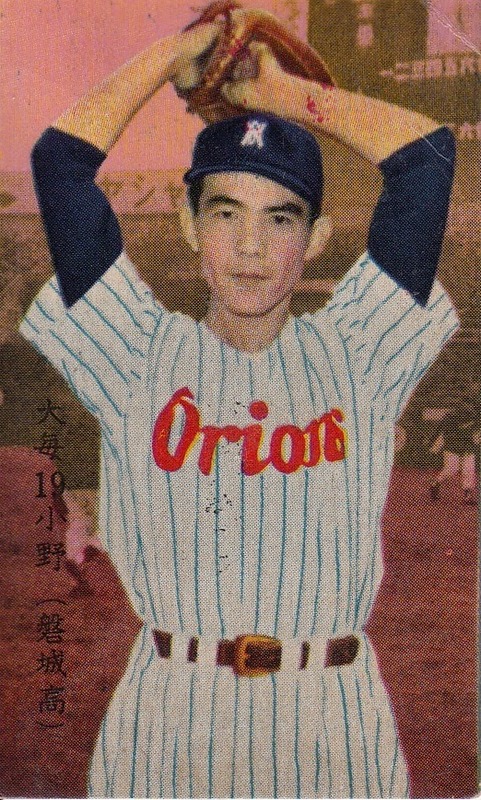 Following the 1957 season, the Orions and the Daiei Unions merged to become the Daimai Orions. 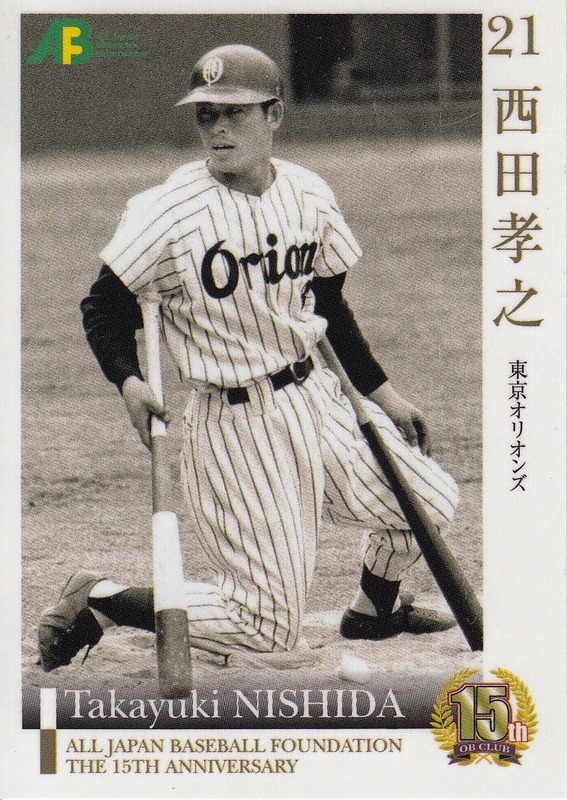 They moved into a new ballpark (Tokyo Stadium) in 1962 and the team was renamed the Tokyo Orions before the 1964 season. 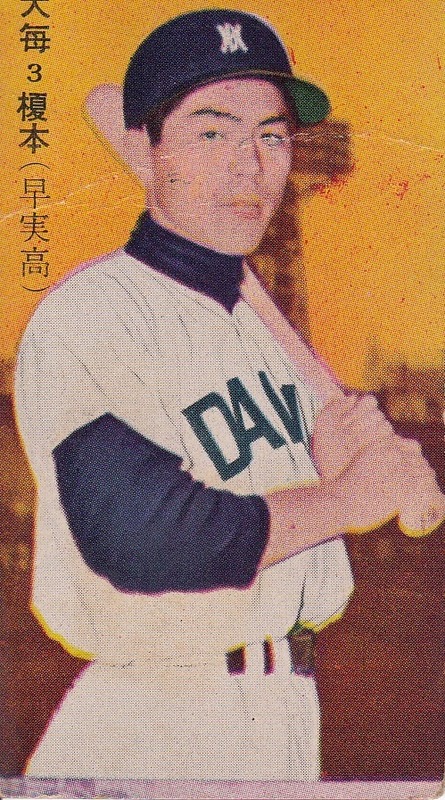 After 1968, Lotte bought the team and renamed them the Lotte Orions. Tokyo Stadium went bankrupt in the early 70's which prompted an existential crisis for the team that nearly resulted in them merging with the Toei Flyers. 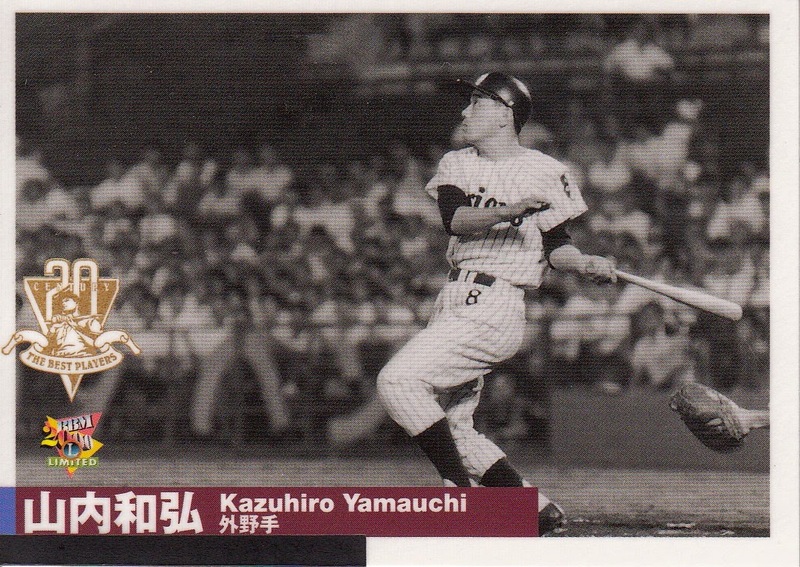 The team moved to Sendai for a number of year, then back to Kanto, replacing the Whales in Kawasaki when Taiyo moved to Yokohama in 1978. 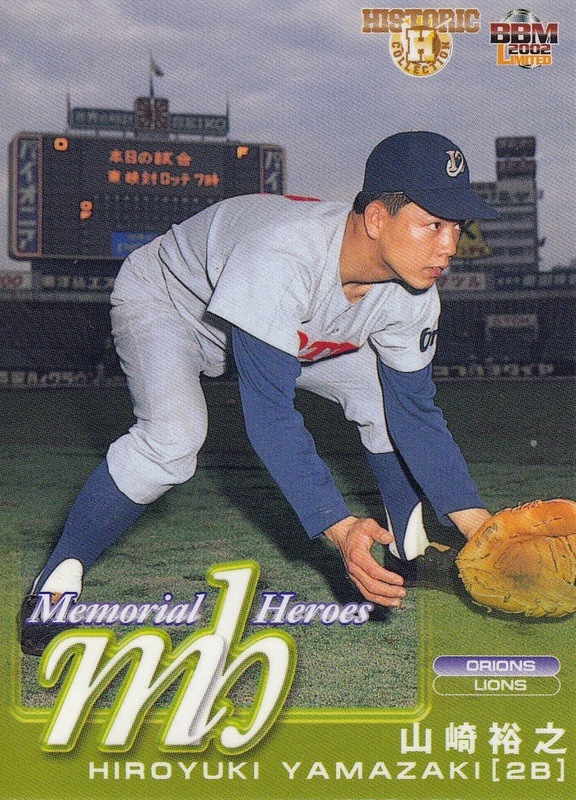 The team moved from Kawasaki to Chiba in time for the 1992 season and was renamed again the Chiba Lotte Marines. The selection of uniforms in BBM's Memories of Uniform for the Marines was pretty weak. 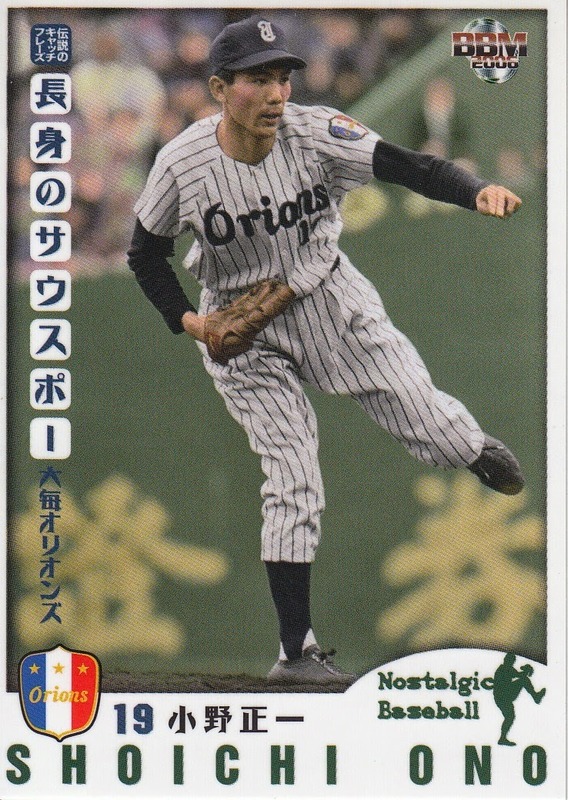 There are no cards for the pre-Lotte team and only one card showing a Lotte Orion uniform (the away uniform used from 1973 - 1991). Also included were the away uniform from 1992-1994 and the home uniform from 1995 to the present. 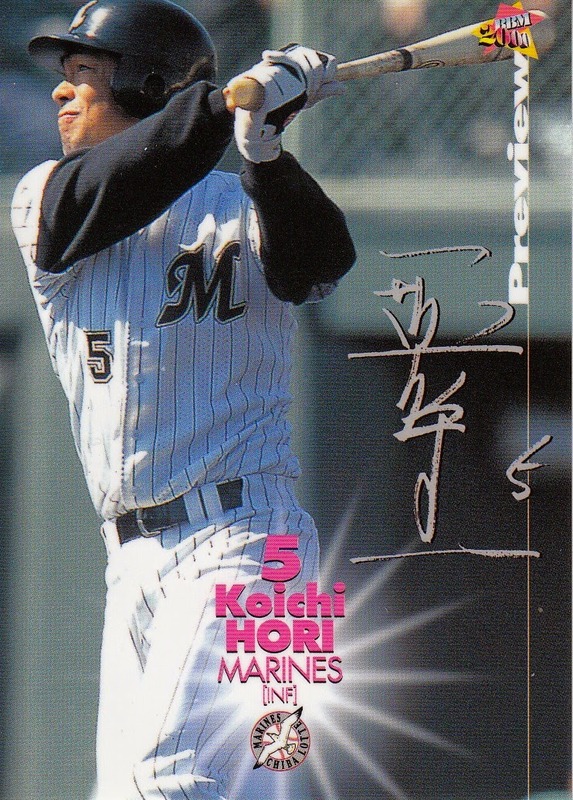 The other uniforms were an alternate uniform used from 2005-07 and two throwback uniforms - the 1973-1991 Lotte home uniform used in 2008 and the 1992-94 Marines home uniform used in 2011. 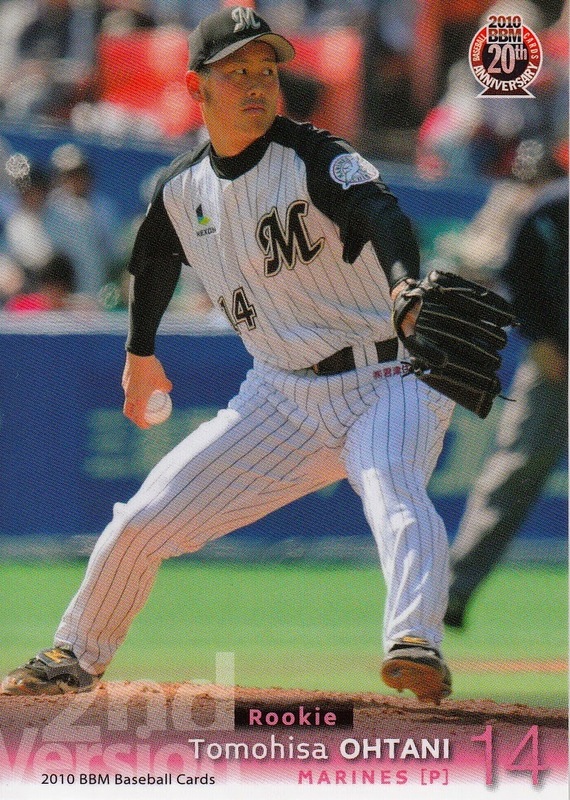 The Mainichi home uniforms were white with pinstripes and an old English style "M" on the left breast. 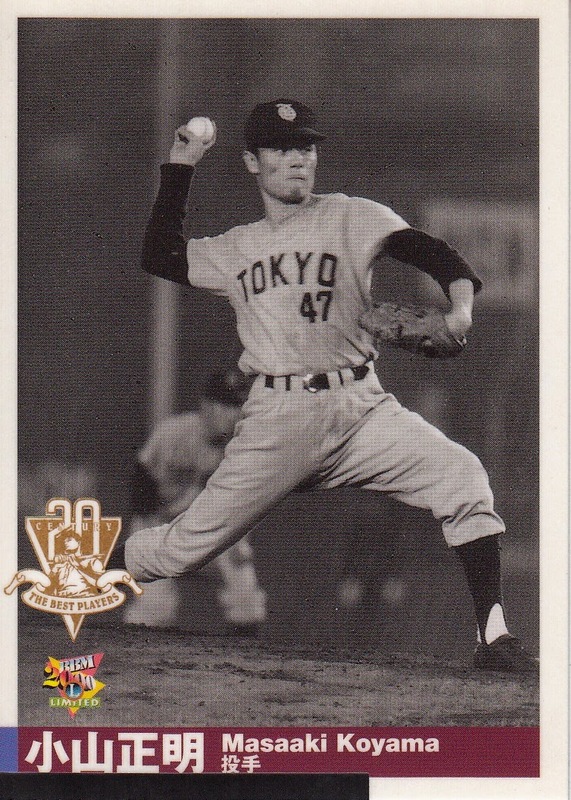 The only real change in the eight years they used this uniform is that there was a red, white and blue patch that appeared on the left sleeve in 1951 and 1952 that celebrated the team's victory in the first Nippon Series in 1950. 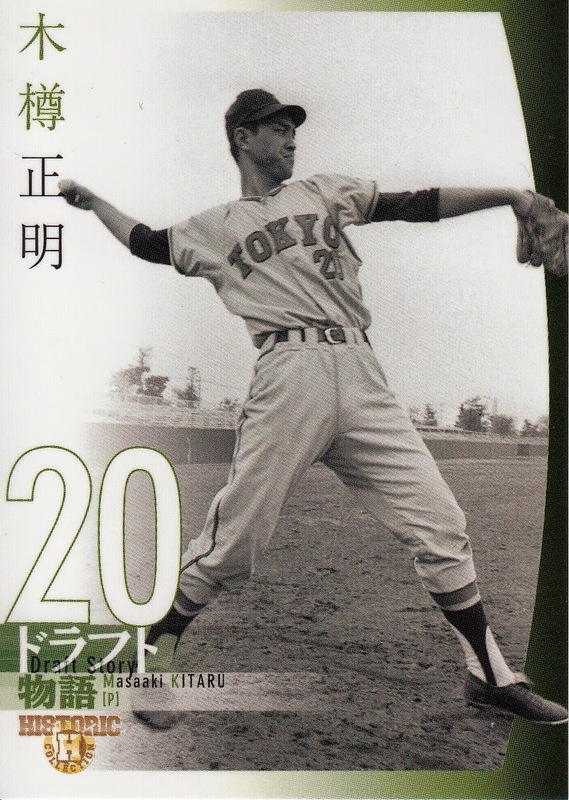 The text changed again, this time to "Tokyo" in the away uniforms used for the final two seasons of the Mainichi era, 1956-57. The red, white and blue left sleeve patch reappeared although this time it just said "Orions". 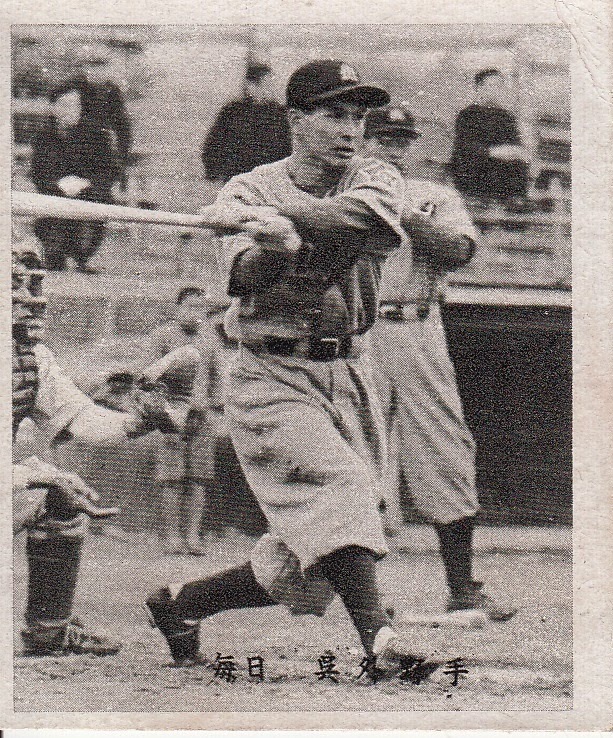 Following the merger with Daiei the home uniforms remained white with pinstripes but they now had "Orions" across the front. 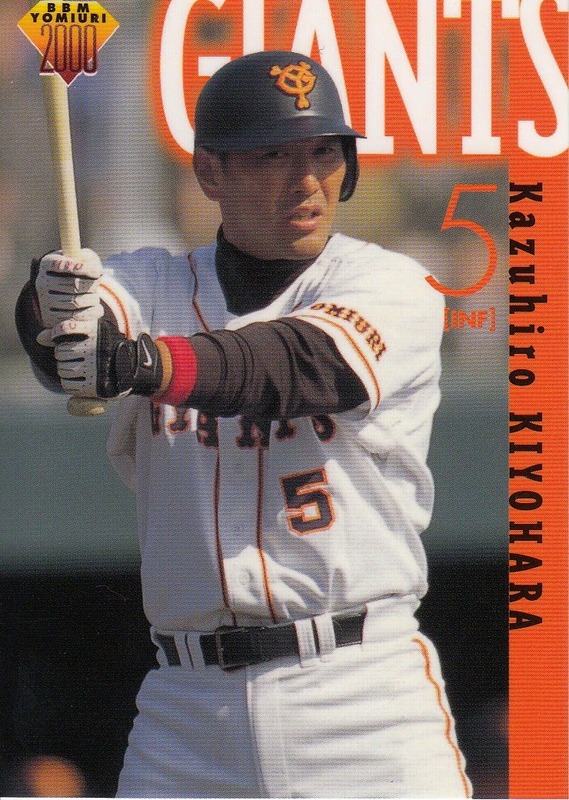 This card shows the home uniform but the color of the text is not correct - it was black not red. The away uniforms now had "Daimai" across the front. The uniforms changed again for the 1967-68 seasons. For the first time, the home uniform did not feature pinstripes. The text on the front of the uniform was still red but it was a smaller font and the number on the front was now in blue or black. The hat logo changed to a white "T". 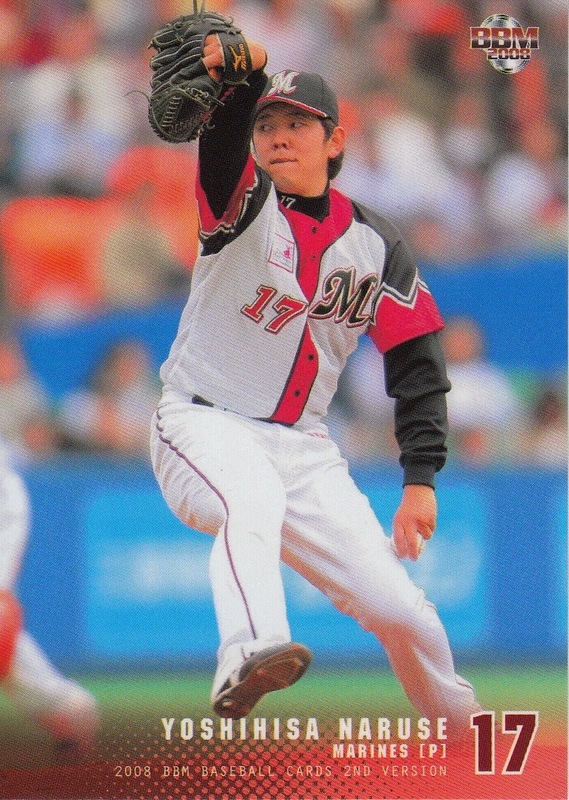 Unfortunately I do not have any cards showing this uniform. 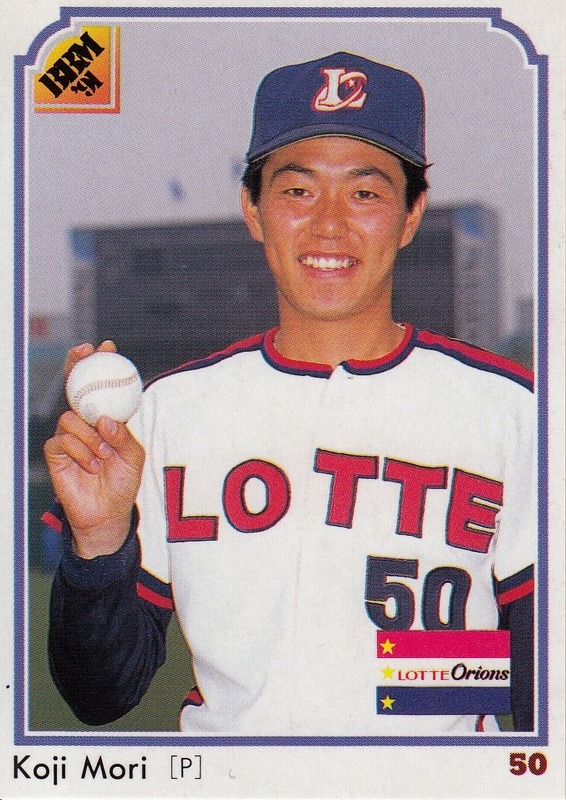 The uniforms used during the first four years of the Lotte era were very similar to those of the final two Tokyo Orions seasons. The text on the front of the uniforms remained red and the home uniform remained pinstripe free. 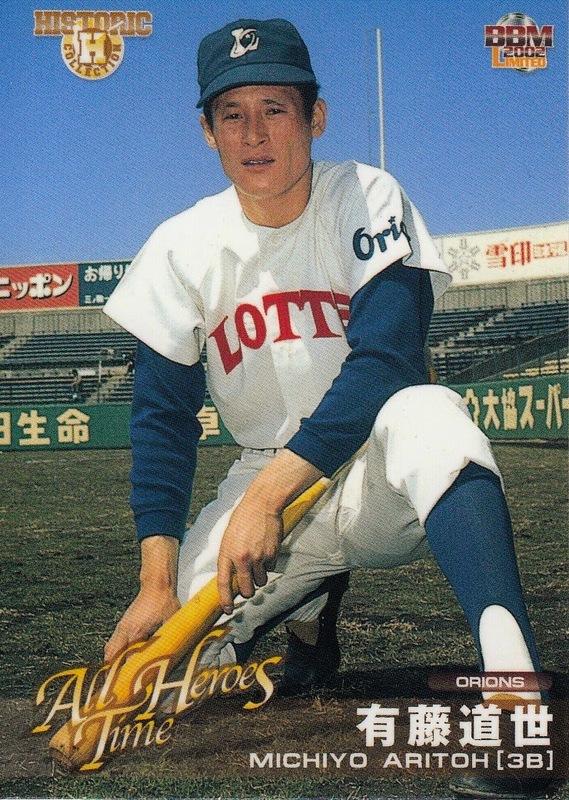 The biggest changes were that both the home and away uniforms now said "Lotte" across the front (with "Orions" on the left sleeve) and the numbers were removed from the front of the uniform. The home and away uniforms were essentially identical except for the color. The hat logo changed to an interlocking "L" and "O" design. The home uniform the Marines adopted in 1995 is the same one being used today. 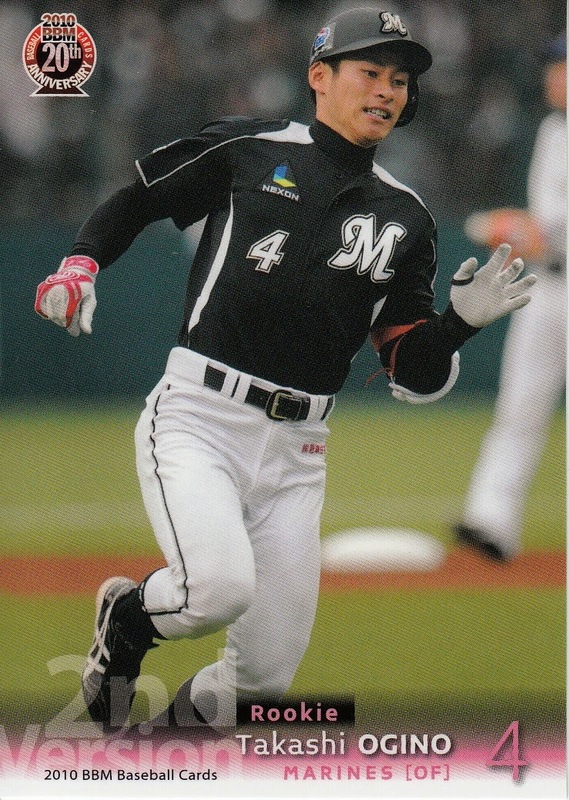 It's very similar to the original Mainichi uniform, white with pinstripes and an "M" in black on the left breast. The biggest change is the inclusion of the uniform number on the the front of the jersey on the right side. (This card was included in the set). 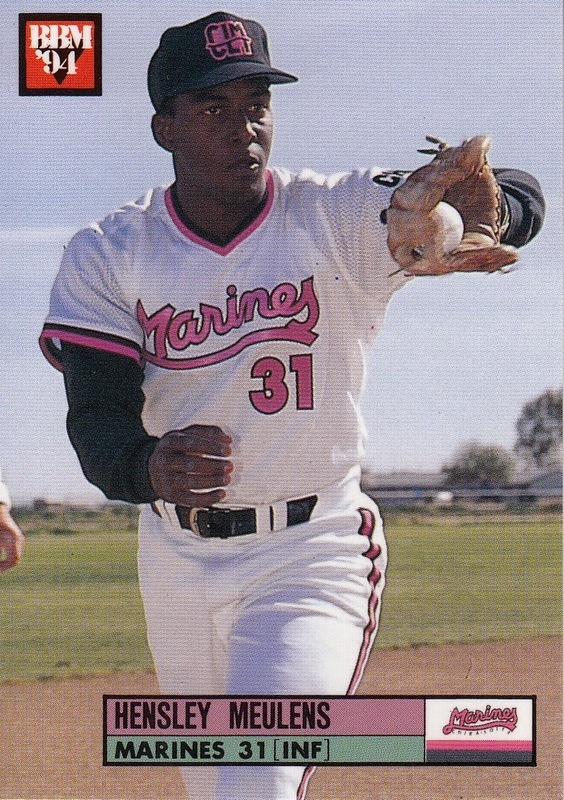 The away uniform also did away with the pink text and simply said "Marines" on the front with the number on the left side. The Marines have used a large number of alternate uniforms over the years. I was not able to track them all down (most significantly I was unable to find a card showing the 1998 sleeveless jersey) but I was able to find the 2003-04 alternate (3rd) visitors jersey, the 2005-07 alternate home uniform, the 2008-09 home and away alternates and the 2010 "3rd" jersey. 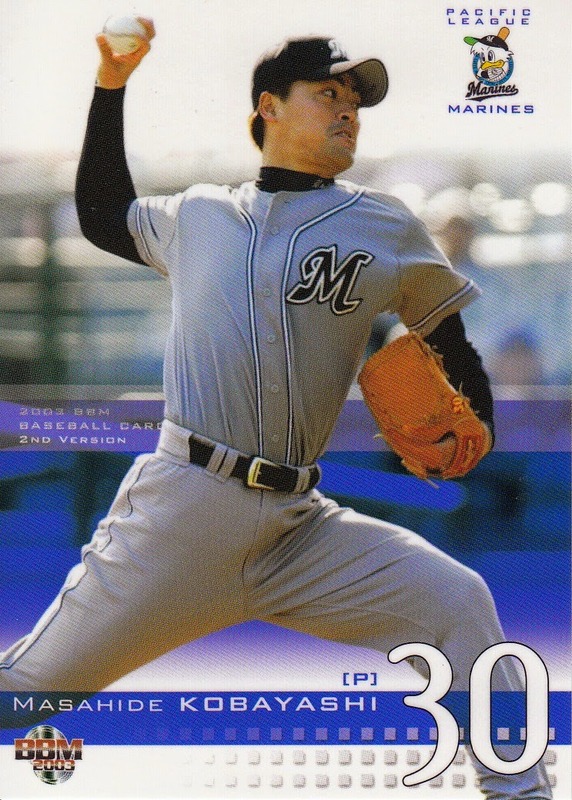 I'm not positive but I think a bunch of the post-2004 alternates were used for interleague. I was intrigued by something that Larry Fuhrmann had told me a while back regarding how card companies treated rookies before BBM came along so I decided to do a little research. 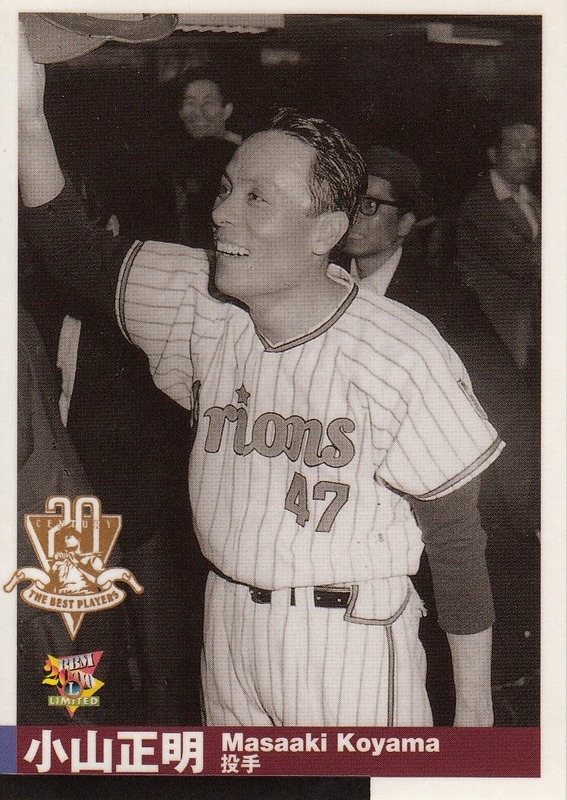 Larry had said that the card companies (Calbee in particular) pretty much refused to print cards of rookie players as they felt they needed to "earn their stripes". One of the things that Larry insisted that BBM do when they started publishing cards was to include rookies. I got curious then about the early BBM sets. 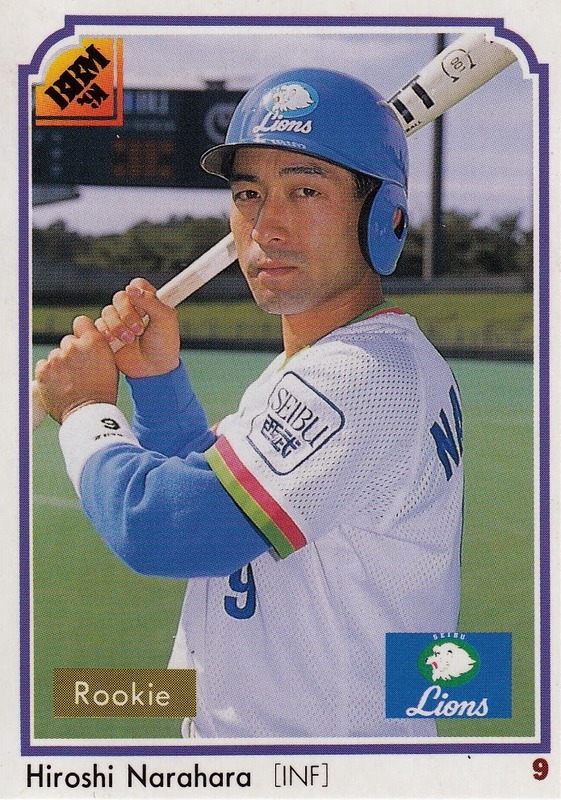 I've always found it curious that while the 1993 BBM set contains the rookie cards of both Hideki Matsui and Ichiro Suzuki, only Matsui is labelled by BBM as a rookie (i.e. 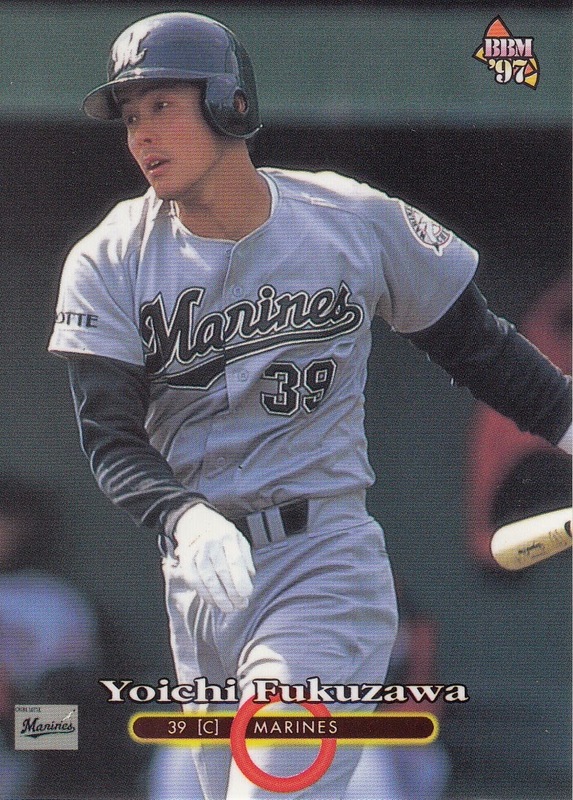 the word "Rookie" appears on the front of the card). So I started looking into which cards were labelled "Rookie" in the first few BBM sets. What I found was not particularly surprising once I started thinking about it. In the 1991 BBM set, there are by my count 30 players that are labelled as "Rookie". All 30 players were drafted in the fall 1990 draft. 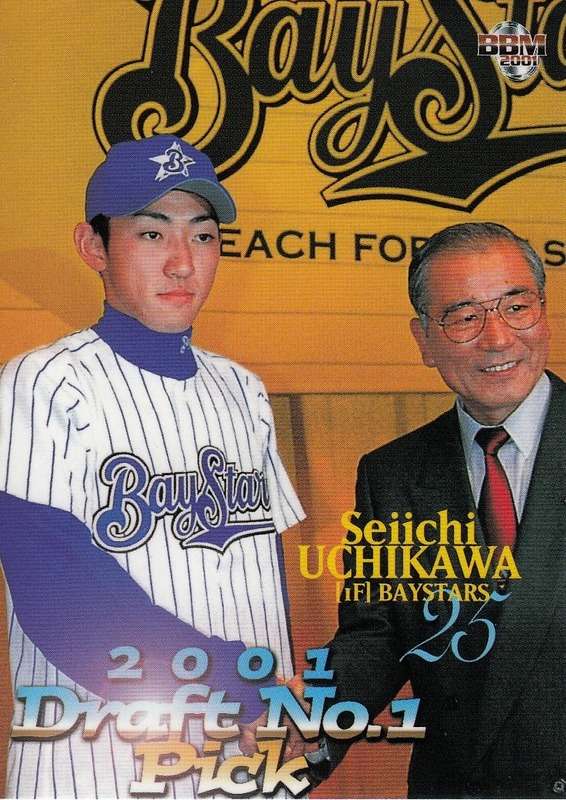 Six teams (Blue Wave, Buffaloes, Carp, Fighters, Swallows and Whales) have their top three draft picks represented in the set. 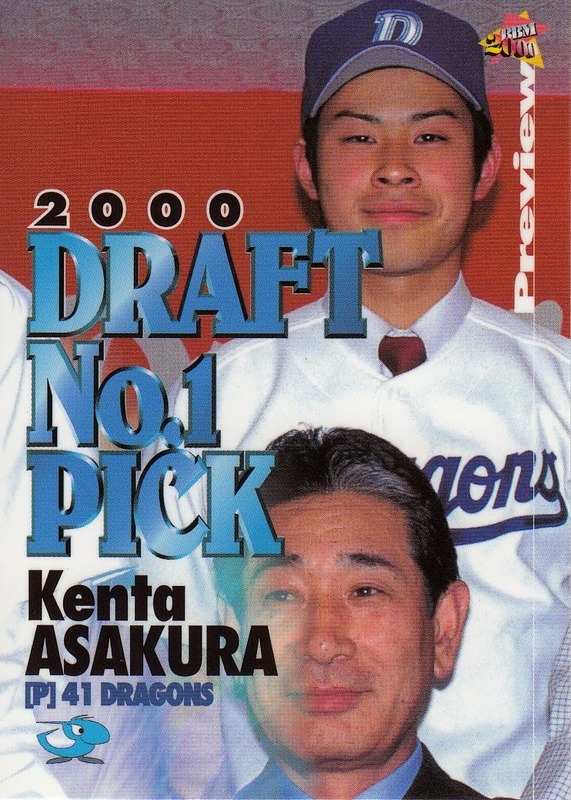 The Giants, Hawks, Orions and Tigers had just their top two picks included while the Dragons had their first, second and fifth picks included and the Lions had only their second round pick included. The 1992 BBM set contained 35 rookie cards - the top three picks for each team from the fall 1991 draft with the exception of the Lions who only included their top two picks. The Lions fell into line for the 1993 set as all twelve teams had their top three picks from the fall 1992 draft included (for a total of 36 rookie cards). 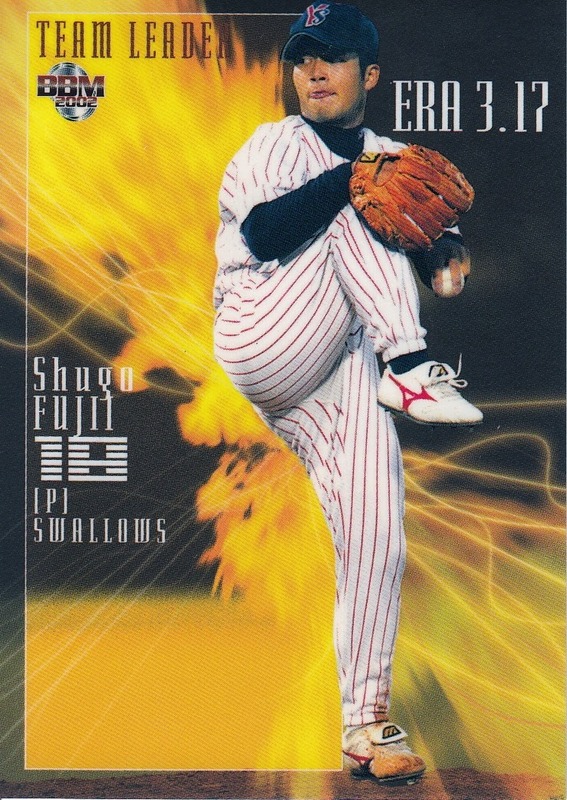 For the 1994 set, BBM included cards of all the players taken in the fall 1993 draft and they've pretty much included all the players from the previous fall's draft in every flagship set (at least the 1st Version ones) since then. One implication of this is that BBM now rarely has a rookie card for a player that is not labelled as such. 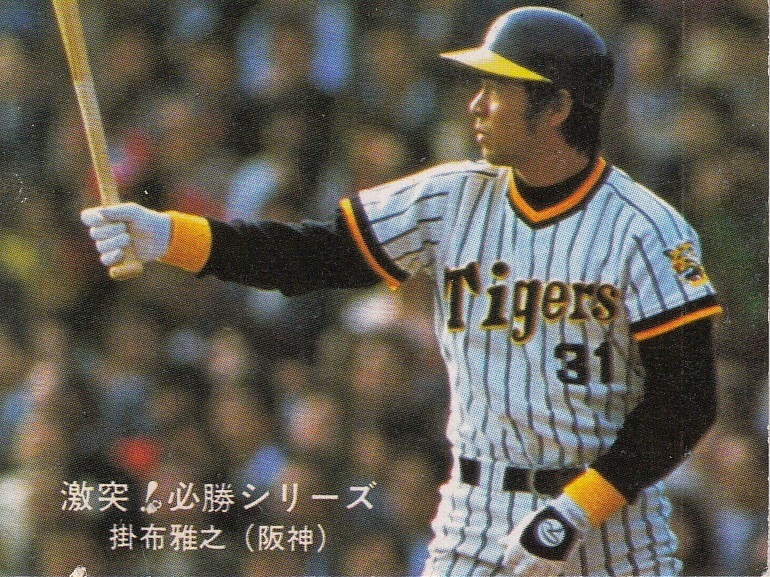 NPB Reddit posted a link the other day to a mostly complete broadcast of the Tigers/Giants game at Koshien on April 17, 1985. 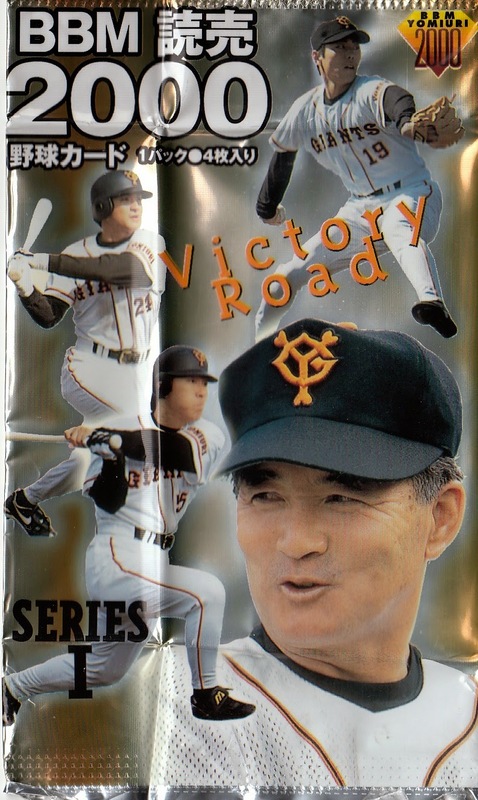 This particular game is memorable for what happened in the bottom of the seventh after the Giants were up 3-1 and the Tigers got two on with two out. If you want to watch what happened next, fast forward to about the 1:20:00 point in the video. 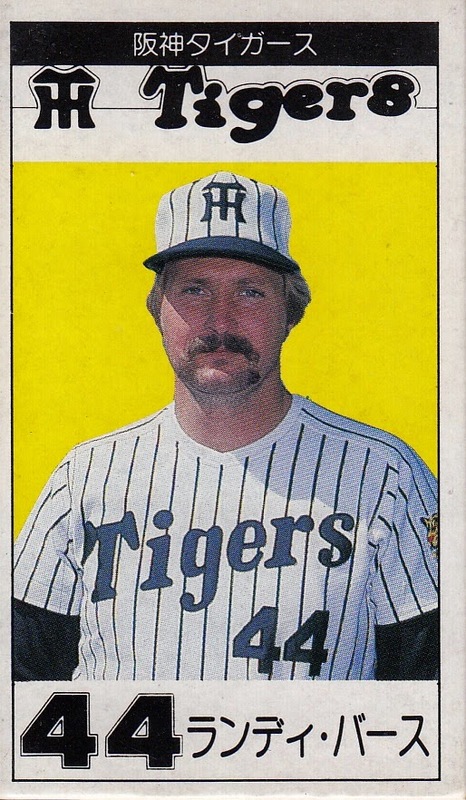 Randy Bass hit a three run home run to put the Tigers up 4-3 and both Masayuki Kakefu and Akinobu Okada followed him with solo home runs to get the lead up to 6-3. The Tigers would need all those runs to hold off the Giants who scored another 2 runs in the top of the ninth to bring the final score to 6-5. 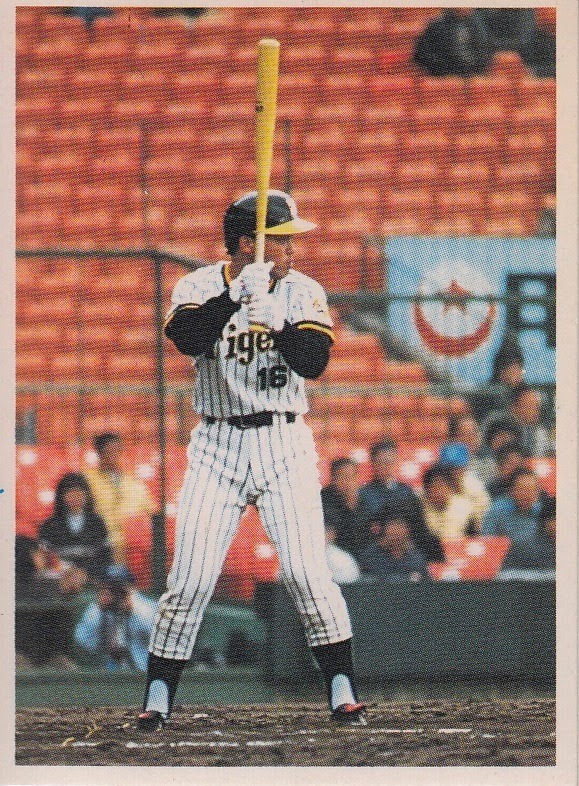 This game is viewed as a sign that 1985 was going to be a magical season for Hanshin and it was as they won their first (and so far only) Nippon Series that year. 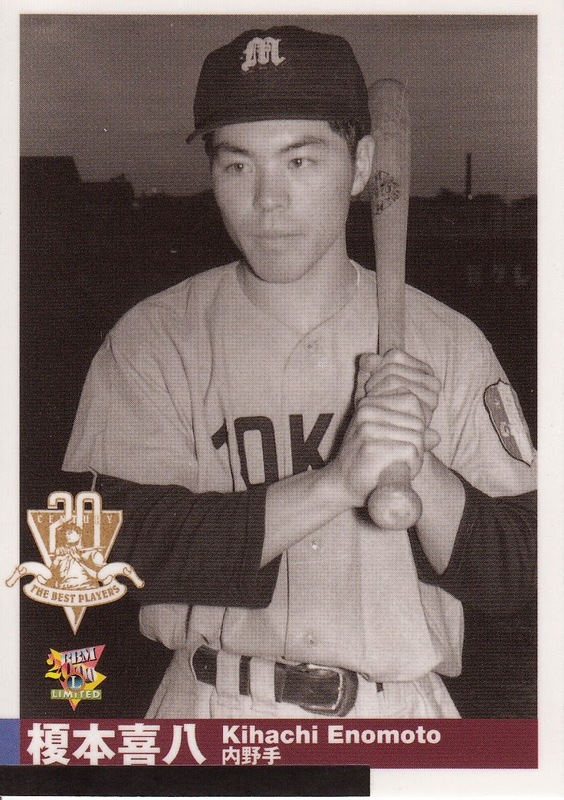 I saw a post at the Shlabotnik Report the other day speculating that the player cards in the Topps Opening Day set this year might feature different pictures than the player cards in the regular Topps set. This got me thinking about BBM's similar set from around the turn of the century - the Preview set. I'm not sure it's a coincidence, but BBM introduced the Preview set in 1999, a year after Topps had started doing the Opening Day set. Like Opening Day, the BBM Preview set was a smaller set that (at least the first few years) used a similar design to that of the flagship set. Unlike Opening Day, however, Preview was released two months before BBM's flagship set. I believe Topps has always released Opening Day after Series One was released but I may be wrong. As I mentioned, BBM released the first Preview set in 1999. It featured 122 cards - 120 player cards plus two checklist cards. The 120 player cards were split evenly among the 12 teams. 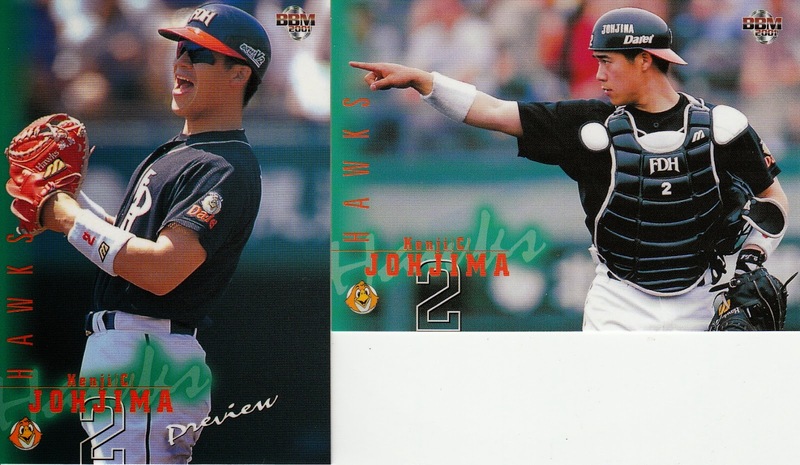 I don't have any cards from this set so I'm not entirely certain but I believe that the cards looked identical to the regular 1999 cards except that "Preview" appeared on the front of the card. The backs were identical except for the card number. There was a facsimile autograph (in pink!) parallel available for half the player cards. 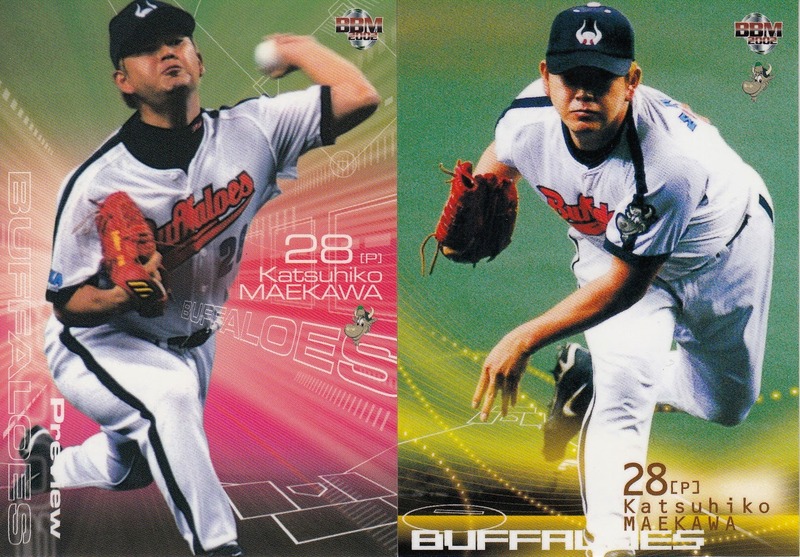 There were also four insert cards that served as preview cards for the Leader subset of the regular set - they featured the 1998 MVP and Rookie of the Year winners. As you can see, the fronts are identical except for the "Preview" text and the vertical line. 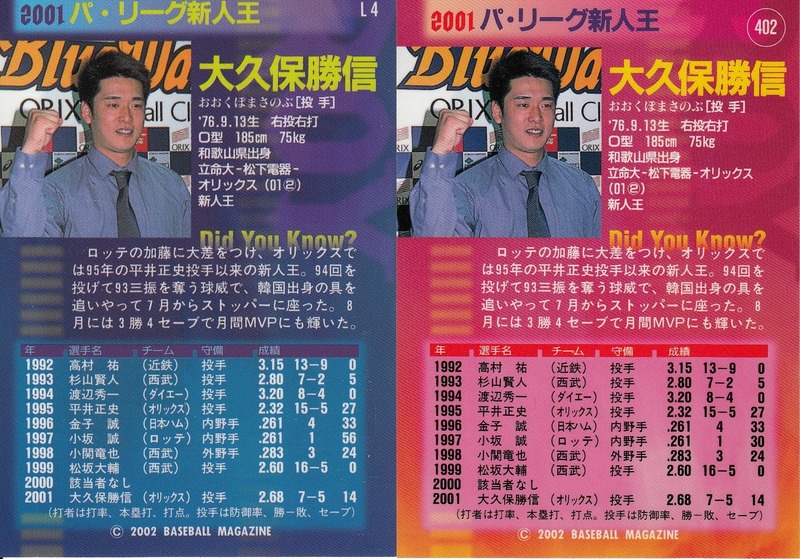 The backs appear to differ only in the card number and the portrait. 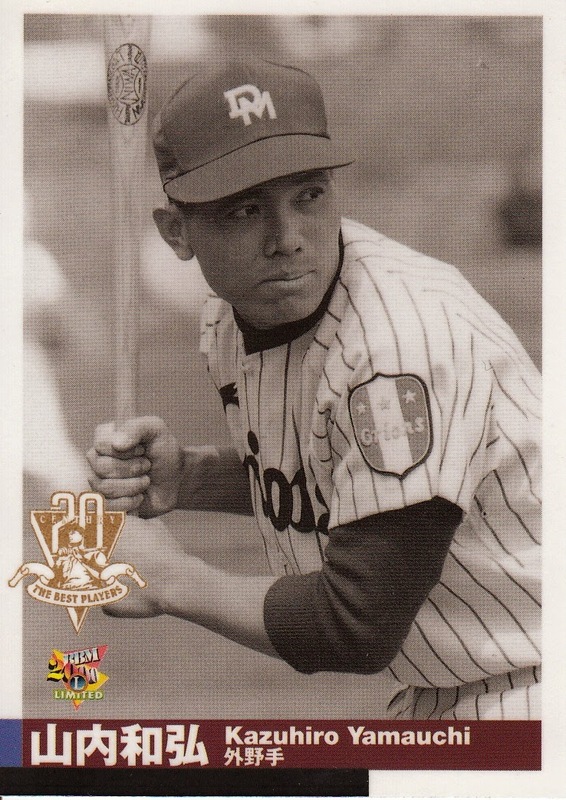 The big new thing for the 2000 was the addition of 12 more cards depicting the first round pick from the fall, 1999 draft for each of the teams. This would bring the total for the set to 134 cards. Once again the Preview set featured a facsimile signature silver parallel but this time all 120 non-draft pick player cards had a parallel. In addition, there was a super rare gold facsimile signature set for all 11 (including the draft pick) players from the Tigers. It's not clear to me that these were available in packs - they may have been some special promotion for BBM with the Tigers. There was also a six card insert set that again was a preview for the Leaders subset from the flagship set. 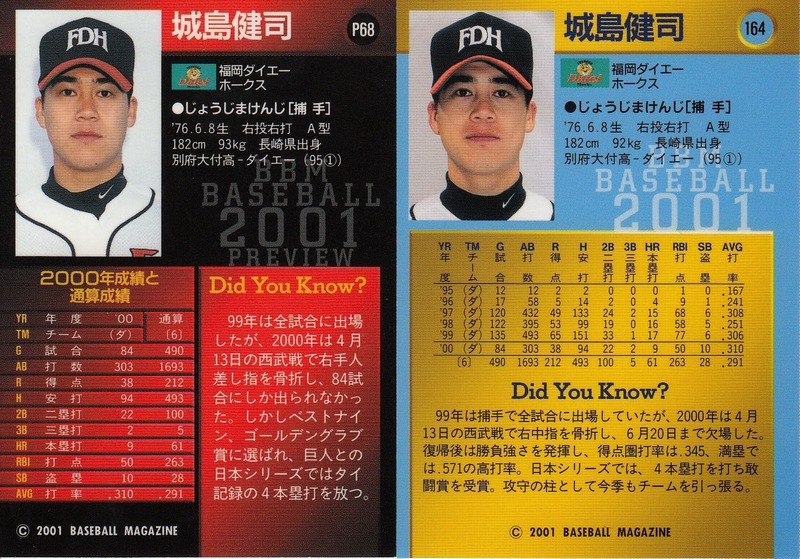 This time the cards featured the 1999 batting leaders, victory leaders and Rookie of the Year awatd winners. The big difference between these cards and the "flagship" version is that these cards have the leader category in gold foil. There were no signature parallel cards for the 2001 BBM Preview set but there were two insert sets. 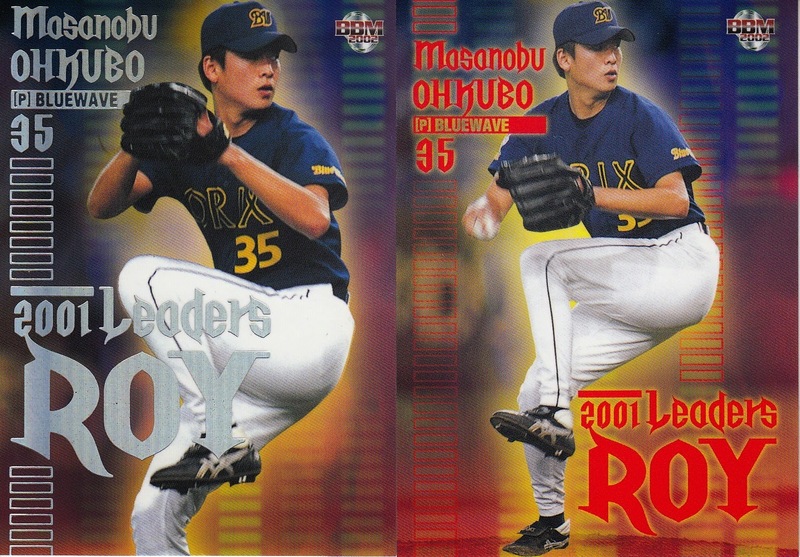 One was a four card Leader preview set featuring the 2000 MVP and Rookie Of The Year award winners with silver foil text. The other was the nine card Century Best 9 set featuring the winners of the 20th Century Best 9 balloting. 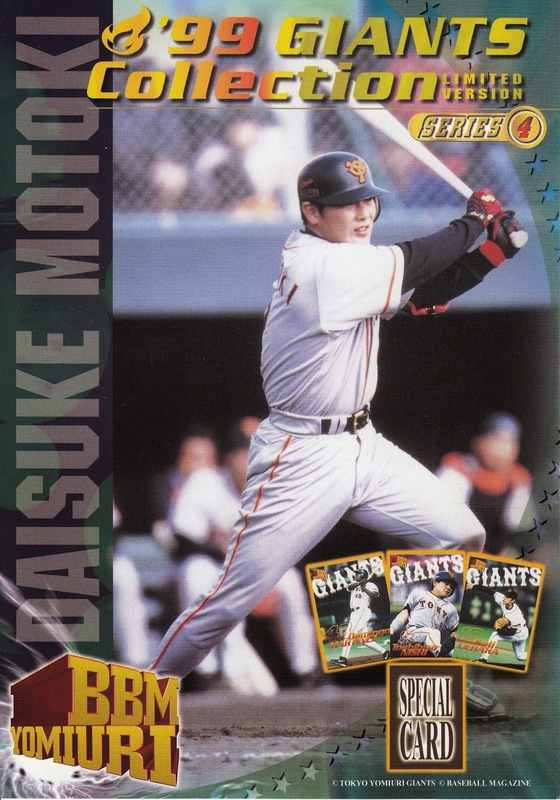 Note that the Preview and 1st Version cards share the baseball diamond in the upper right of the card while the Preview and 2nd Version cards share a batters box outline (although from different perspectives) towards the bottom of the card. 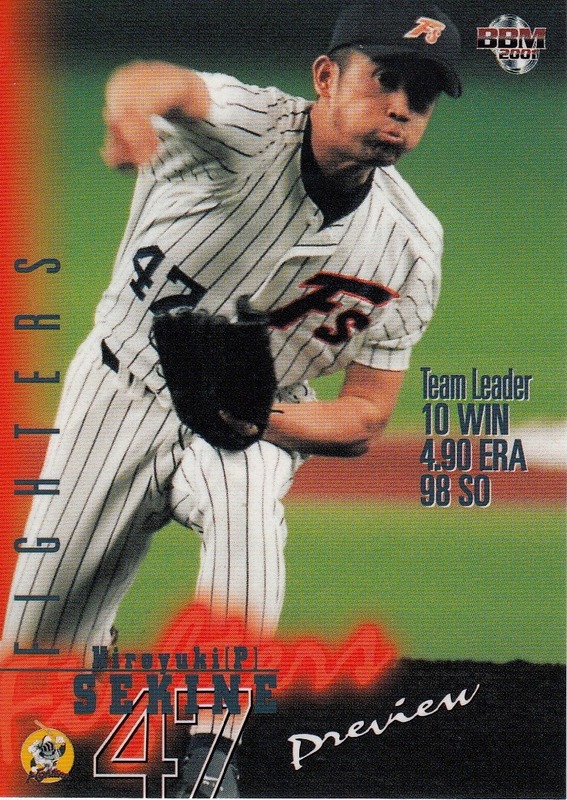 The second insert set (that could actually be considered two separate insert sets) took its cue from the "team leader" annotations from the 2001 Preview set. This included the batting average and ERA leaders from each team, for a total of 24 cards. (The batting average leaders were numbered separately from the ERA leaders which is why they could be considered separate insert sets). The 2002 set would be BBM's final Preview set. In 2003, BBM replaced this set with the Rookie Edition set which would expand Preview's draft pick subset to include all the players taken in the annual draft. 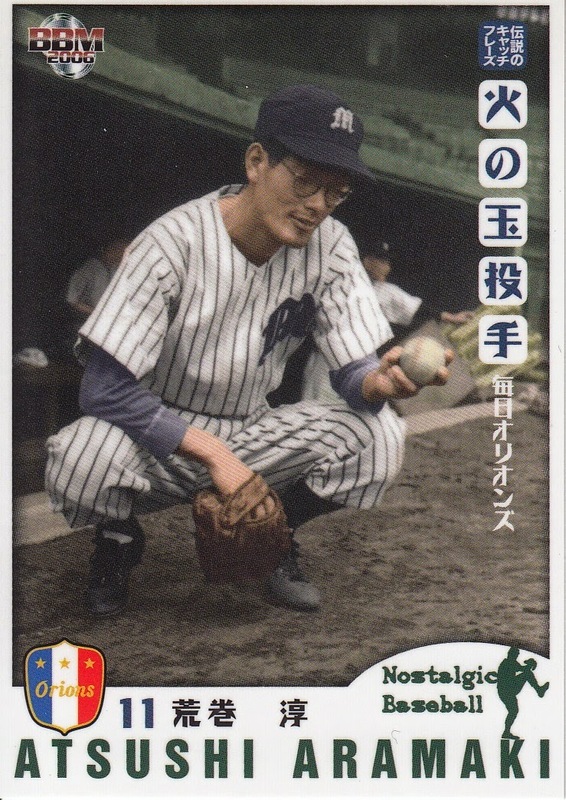 Not that this will be a surprise, but I used Gary Engel's "Japanese Baseball Card Checklist and Price Guide" (7th Edition) extensively in researching this post.